If you’re a homeowner who’s dealt with a mold problem in your house, you might be wondering how these issues can affect the value of your home. Will you have a hard time trying to sell your home if there was once a mold problem? As long as you are honest with prospective buyers, and treat any problems before you hand over the keys, you can protect the value of your home. Before putting your home on the market, have it inspected for mold. If you have a mold problem, you’ll need to have it taken care of before your list your home. This is an especially important step in the selling process if you notice dank, musty smells in the basement or attic, excessive moisture buildup, or budding mold growth on floors, walls or ceilings. 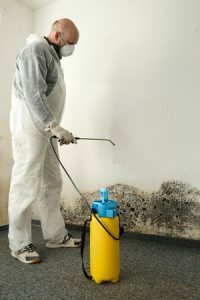 A mold remediation team can assess the extent of the problem, clean and sanitize the area, and make recommendations for repairs that will prevent the mold from returning. If, however, you discover mold after putting your home on the market, the best thing to do is be honest with your prospective buyers and let them know how you plan on treating it. Hopefully, if it’s a simple case of benign household mold, the interested buyers will understand that this is a common problem which can be easily remedied with professional help. Toxic mold, on the other hand, can bring the selling process to a halt. If a buyer’s inspector discovers mold on your property, whether or not you were aware of it, you could have a hard time getting the full list price of your home. Likewise, if you suspect your home may have a mold issue, it’s always best to deal with the problem before putting it on the market. A comprehensive mold inspection can give you the peace of mind of knowing that you can get the best possible return on your home. Contact us today for a consultation with the mold experts at Jun’s.